UNITED STATES MINT SELECTS SOTHEBY’S AND STACK’S TO SELL THE “FORBIDDEN FRUIT” OF THE COIN WORLD ON JULY 30, 2002 New York, NY – On July 30, 2002 Sotheby’s and Stack’s will offer for sale for the first time, on the behalf of the United States Government, the most valuable gold coin in the world, the fabled and elusive 1933 Double Eagle twenty dollar gold coin. This is the first time that the United States Government has authorized private ownership of a 1933 Double Eagle. After it was struck in 1933, President Roosevelt, in one of his first acts as President, took the United States off the gold standard in an effort to help the struggling American economy out of the Great Depression. All of the 1933 Double Eagles were ordered destroyed, but ten specimens are known to have escaped into private hands. However, as they had never been officially “issued” as United States coinage, they cannot be legally owned. As a result, nine of the ten specimens were seized by, or turned in to, the United States Secret Service in the 1940s and 50s and were subsequently destroyed. The remaining 1933 Double Eagle, which will be offered, surfaced in 1996 and was seized by the United States Secret Service. The coin was returned to the United States Mint as a result of the Department of Justice’s settlement of a forfeiture action, and in that landmark legal settlement, this one coin became the only 1933 Double Eagle now or ever authorized for private ownership by the United States Government. The coin will be sold in a single lot auction at Sotheby’s York Avenue premises in New York on July 30, 2002, and carries an estimate of $4/6 million. “We expect that this coin may become the most valuable coin in the world and one of the most sought-after rarities in history” said David Pickens, Associate Director, United States Mint. The twenty dollar gold coin, known as a Double Eagle, was a child of the California Gold Rush, and the massive shipments of ore sent back East. The first Double Eagles were issued to the public in 1850. In 1907, at the behest of President Theodore Roosevelt, the denomination was radically redesigned by famed American sculptor Augustus Saint-Gaudens. 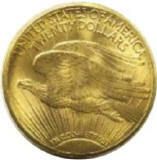 These were struck until 1933 when production of the Double Eagle was discontinued along with all other United States gold coins as a result of Executive Order 6260 issued by President Franklin Roosevelt which, in an effort to aid the struggling American economy, prohibited banks from paying out gold. According to the United States Government, any Double Eagle struck in 1933 could not be legally owned, because none were officially released to the public. In early 1944, prior to the government’s discovery of the missing 1933 Double Eagles, the Royal Legation of Egypt presented a 1933 Twenty Dollar Double Eagle to the Treasury Department, seeking a license to export the coin to Egypt for King Farouk’s collection. The export license was required for virtually all gold coins under the extensive gold restrictions that had been in effect since March of 1933. Not yet recognizing the significance of an un-issued 1933 coin, the Department of the Treasury inadvertently issued the export license and the King Farouk specimen was exported out of the United States. Within weeks Government officials came to recognize the significance of the 1933 Double Eagle, and discovered the existence of nine other 1933 Double Eagles that illegally left the Mint without ever being issued. Over the next ten years, these nine 1933 Double Eagles were seized or voluntarily turned in to the Department of the Treasury, and were subsequently destroyed. In 1954, a 1933 Double Eagle appeared at auction in Cairo, Egypt; Sotheby’s, acting on behalf of the new Republic of Egypt, was selling the astonishing collections assembled by the deposed King Farouk. King Farouk was one of the greatest coin collectors of all time, though it was not until this auction that the world learned of his remarkable achievement – the collection comprised more than 8,500 gold coins and the sale itself took nine days. Lot 185 in that auction contained a 1933 Double Eagle. Learning of the offering, the United States Treasury successfully requested that the coin be withdrawn from the sale. After this, the whereabouts of the coin remained a mystery for nearly half a century. It has been suggested, in sworn depositions, that the present coin is the King Farouk coin, and there is significant evidence that it was part of the famed collection, including the fact that no other 1933 Double Eagle is known to exist or has ever been identified. The location of the present coin, since its minting in 1933, had been a mystery until 1996 when it was seized at the Waldorf-Astoria in New York as respected and leading British coin dealer, Stephen Fenton, attempted to sell it to Secret Service agents who were posing as coin collectors. The legal proceedings which lasted five years, ultimately resulting in a ground-breaking settlement which specifically allows this particular Double Eagle, nearly seventy years after its production, to be the only 1933 Double Eagle permitted to be privately owned. The new owner of the coin will be given an official Certificate of Transfer that makes the coin legal to own. Given the complex issues surrounding the elusive 1933 Double Eagle, this Certificate of Transfer, will be itself historically significant. This sale represents a partnership of Sotheby’s, whose history of coin auctions stretches back to 1755, and Stack’s, an American numismatic firm whose first coin sale was held in 1935. Most recently, in October 2001, Sotheby’s and Stack’s worked together to sell the fabled Dallas Bank Collection for $7.8 million.